Format: Hardback (Children's Edition. Adult edition also available with red jacket). Official synopsis: "In 1943 Max Carver's father - a watchmaker and inventor - decides to move his family to a small town on the Atlantic coast. They move into a house built for a prestigious surgeon, Dr Richard Fleischmann and his wife but abandoned when their son drowned in a tragic accident. Behind the house Max spies an overgrown garden surrounded by a metal fence topped with a six-pointed star. When he goes to investigate, Max finds statues like troupe fill the garden. In the centre is the large statue of a clown set in another six-pointed star. Max has the curious sensation that the statue is beckoning to him. As the family grows increasingly uneasy when they discover a box of old films belonging to the Fleischmanns, his sister Alicia has unsettling dreams while little Irina hears voices whispering to her from an old wardrobe. But Max spends most of his time with his new friend Roland, who takes him diving to the wreck of a boat that sank close to the coast in a terrible storm. Everyone on board perished except for one man - an engineer who built the lighthouse at the end of the beach. During the dive, Max sees something that leaves him cold - on the mast floats a tattered flag and on it is the symbol of the circle and six-pointed star. As they learn more about the wreck, the chilling story of a legendary figure called the Prince of Mist begins to emerge . . ."
Originally written and published in Spanish in 1993, Zafon's first ever published novel. Now, 17 long years later it has been translated into English and released by Orion Books in both adult and children's editions. The adult edition has a cool red cover, but my personal fave is the children's edition. A stunning blue jacket! 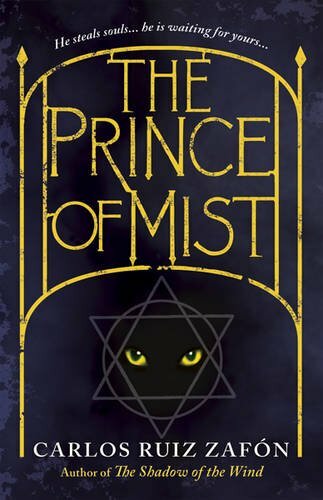 The Prince of Mist, in short, is a stunning book and I can't help wonder why it's taken so long for it to reach our shores. It is a fantastic story. It flows well, the characters are intriguing and the plot is rich in supernatural goings on. 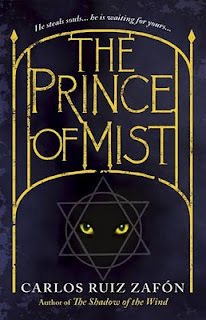 From the mysterious death of little Jacob Fleischmann to the horror of The Prince of Mist himself! I really don't know what I can say that won't spoil the book for everyone. There's always something happening. Not always major. Just little events that on first read seem insignificant, but the further on you go, the more it all makes sense. I'll admit, towards the start of the book I suffered from some confusion, but the nearer I got the the end, it all fit together. Such a good read. Scary in places as well. I don't want to give too much away but there was a bit involving young Irina in her bedroom, a wardrobe that won't stay locked and the stairs. Probably one of my favourite scenes from the book in a tense and scary sort of way. Quite unsettling really. It definitely made me want to make sure my own wardrobe was firmly closed and thankfully my bedroom door doesn't have a lock on it. As for the stairs, there was some careful steps taken! And that cat! Creepy. I am now scared if my cat gives me a funny look or side glance! People definitely need to read this! It doesn't seem nearly 20 years old, and that for me is important for reading. Stories should age well and not seem too dated. And this certainly doesn't. One very happy reader. Thank you to Carlos for answering my question and deeming it interesting enough to win a signed copy! :D And thanks to Waterstones and the brilliant Nina Douglas at Orion! Ooh! I am so glad I have a copy of this to read. It sounds a little scary but also very literary too. I also happen to love translated novels. I like other cultures being brought into the UK.